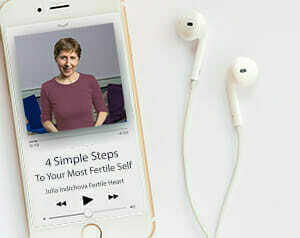 Their Stories, Your Fertility Drug: Read the love notes of inspirational stories from women who participated in the Fertile Heart Intro Teleconferences and Woodstock Workshops and used the tools of the program before and throughout their IVF Treatment. I have some news. I am pregnant! It is very new and I alternate between being ecstatic and nervous. We saw and heard the heartbeat today! The doctor said everything is measuring on target and looks great. We did do IVF… but this time it was on my timetable, for reasons and protocol that made sense to me, and not because some doctor said in vitro was my only chance, or out of some sense of frenzied urgency. But I don’t believe the IVF made me pregnant. I know it was this process and working with you and the tools. I can not thank you enough, but I don’t believe the work is finished for me. If I am still welcome at the circles, I will be able to request the day off in advance next time. I was diagnosed with endometriosis about two years ago and had laproscopic surgery six months later. I tried to get pregnant for about two years, before and after the surgery, to no avail. I did two IUI’s, which didn’t work and finally decided on my 37th birthday to move on to IVF. My husband and I went to see a high-flying fertility doctor in Manhattan and he gave us a pep talk about IVF, saying that I was an ideal candidate. He did some routine hormone tests and I resigned myself to doing the procedure, though my heart wasn’t in it. I did a day 3 FSH test on a Sunday and got a call later that day from a nurse. She told me my FSH was 17.8 and that the “cut-off” for IVF was 12 or 14. I looked this up on the web after talking to her, desperate for information, and read numerous reports confirming this. I went into shock. My husband and I spent the day crying, feeling like someone just read us a death sentence. Then at one point I got up off the couch, marched over to the health food store, got myself a huge green juice and made up in my mind that I was going to fight this. On the way home I passed Barnes and Nobles and floated up to the childbirth section to look for any shred of information on high FSH. Julia Indichova’s book Inconceivable caught my attention and I immediately bought it and brought it home. This was the beginning of a magical process that would change my life and affirm to me the potential of my own power to change and create circumstances in my life, even beyond pregnancy. I immediately logged on to Julia’s website fertileheart.com and found out that she was having one of her workshops the very next day in Manhattan. I cancelled my plans and showed up to a room full of women at all stages of experience—some were pregnant, some had just happily adopted, some were just embarking on the conception route and some had been at it for a while. In the center of this circle was a small, Eastern European magician with a disarming manner and an irreverent mouth that I instantly loved—Julia Indichova. What she taught me that day and in the one-day workshop my husband and I subsequently attended in Woodstock will last me a lifetime. Today I am 20 weeks pregnant with a little boy and girl (twins!). I did do IVF in the end—after cleaning out my body and doing Julia’s “body talk” and other techniques, I ended up bringing my FSH down to 5.2—a huge drop my doctors in London, my second home, said they had never before seen. With extra phone sessions with Julia, I navigated my way through fertility treatment. Julia is a gem in the world and way ahead of her time. What she has taught me will stay with me long after my children are born.